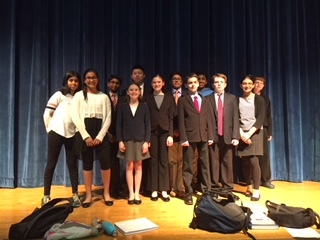 Twelve of our middle school debaters -- Evan, Jacob, Eira, Claire, Nidhi, Aravind, Anisha, Charles, Grace, A.J., Abhi and Clay (who observed) -- headed to the Connecticut Middle School scrimmage to debate the topic of whether national service should be compulsory in the United States. There were 170 debaters. Grace took 3rd place overall! This is especially notable because the first and second place went to teams that had a bye in one of their two rounds. Our team of A.J., Abhi and Grace took Second Place team behind the team with the bye!! Anisha got 8th place speaker overall, A.J. was 9th and Abhi was 11th!! Charles took 23rd speaker and Eira, in her first ever competition, took 28th! Aravind and Claire, also at their first ever competition took 36 and 46 respectively. Our team of Claire, Eira and Nidhi, all at their first competition, won both their rounds and were 9th overall! Our team of Charles, Anisha, and Aravind were 17th overall and Jacob & Evan won one of their two rounds. Jacob got a first in the room! We are so proud of all of you! !